Before a brand new group of socially savvy racers embark on their worldwide adventures, let's take a look at what's in store for them when the newest season of The Amazing Race kicks off on Friday, Feb. 12 at 8/7c. Currently in its 28th season, the series will be sending teams to pit stops in three new countries this time around: Cartagena, Columbia, Tbilisi, Georgia, and Yerevan, Armenia. Plus, these social media influencers—who have over 88 million combined followers—will be traveling over 27,000 miles during their time on the show. That's 18 cities and 10 countries in just a few short weeks. That's a lot of frequent flier miles! Get ready, Race fans, because it's about to be a whirlwind season filled with extraordinary adventures and equally exceptional personalities. 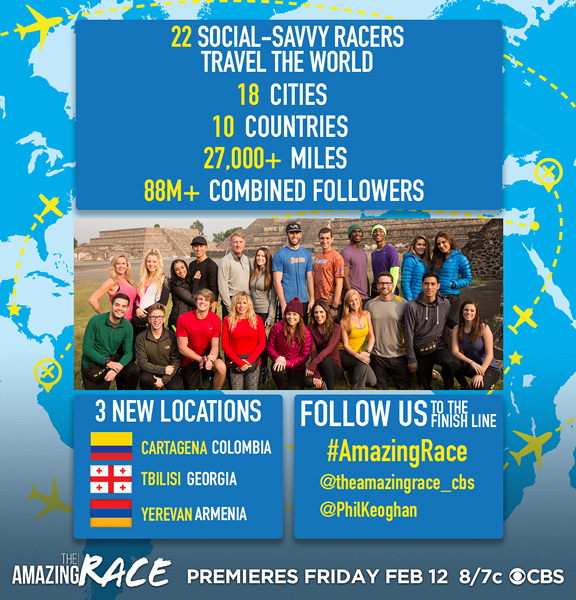 Watch the Season 28 premiere of The Amazing Race when it airs on Friday, Feb. 12, at 8/7c on CBS.